Kalashnikov is on course for the Agetur UK Kingmaker Novices’ Chase at Warwick on Saturday with eight entries were revealed after the race was reopened. Trainer Amy Murphy has also given the six-year-old an entry in Newbury’s Betfair Exchange Chase, registered as the Game Spirit, the same day – but that is just as a precaution. Kalashnikov is a general 7-1 chance for the Racing Post Arkle Trophy at the Cheltenham Festival next month. He won his first two starts over fences, but was beaten by Dynamite Dollars in the Wayward Lad Novices’ Chase at Kempton over Christmas. “He’s absolutely fine. He did his last piece of work this morning,” said Newmarket-based Murphy on Tuesday. 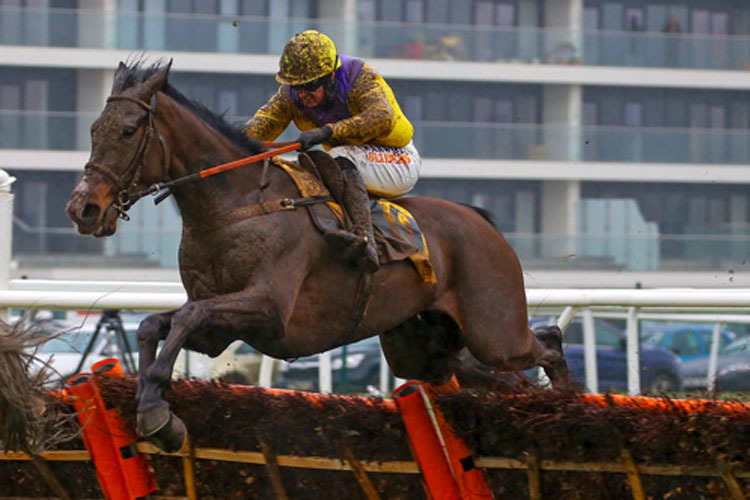 Among the potential opposition to Kalashnikov is Harry Fry’s French import Dalila Du Seuil, who made a winning British debut at Exeter last month. Dan Skelton’s Destrier has won both his starts over fences and holds an Arkle entry, as does the sole Irish-trained entry Articulum. Terence O’Brien’s nine-year-old got off the mark at the second attempt over the bigger obstacles when successful at Naas in December. He also holds engagements in the RSA and JLT Novices’ Chase at the Festival. “He seems in good form. He was due to run at Leopardstown last weekend, but I pulled him out because the ground was just too quick there,” said O’Brien. “He was second to Getabird on his first run over fences and he won the last day, but it was only a three-horse race so we’re not sure where we are with him. Other Kingmaker possibles are Charlie Longsdon’s Castifiore, Dr Richard Newland’s Dustin Des Mottes, Mick Channon’s Glen Forsa and the Nicky Henderson-trained Whatswrongwithyou.